This is about as simple a project as you'll find on this site. That's a good thing, as it addresses a simple problem and it's far too easy to come up with a complicated solution to a simple problem. On many lathes, including the Taig lathe, the tailstock can be offset for turning tapers. Afterwards, the challenge is to adjust the tailstock so it's back on centre. It's easy to get close, but this device makes it easy to make a very accurate adjustment. My friend, Brian Finlayson, demonstrated the use of this device and it was so effective that I decided to make my own. Starting with a Taig blank arbour, I drilled a hole for a tommy bar and then took a light cut to make a smooth surface from end to end. This cut also ensures that the arbour is concentric with the headstock spindle's axis of rotation. Next, I drilled a clearance hole, stopping somewhat short of the tommy bar hole. The next step was to bore a countersink with a 60° included angle, matching the angle of the tailstock ram. Because this hole is bored, we know that it's exactly on the headstock spindle axis. Next, I parted off a puck. After parting, the surfaces looked pretty good, but I wanted them to be smoother. Using a little valve grinding compound, I spun the arbour while holding the puck stationary, while using the tailstock ram to apply pressure. After cleaning off the compound and repeating the operation a few times, I had a nice surface with sharp edges around the periphery of each piece. A surface that's smooth but not polished will tend to retain oil better, which is important in this application. As you can see, the surfaces are almost a matte finish. I cleaned them up with some waterless hand cleaner, followed by detergent and water. A light coat of oil should keep rust away. Here's the tool, in use. With a drop or two of oil to allow the puck to slip freely against the arbour and some more on the dead centre, run the lathe at a reasonable speed and use the tips of your fingers to feel for misalignment of the two pieces. The tailstock centre will hold the stub on centre to itself and the arbour will be on centre to the headstock spindle, the oil helping them to float against each other. Leave the tailstock ram a bit loose and use gentle finger pressure on the lever to press the stub against the arbour. 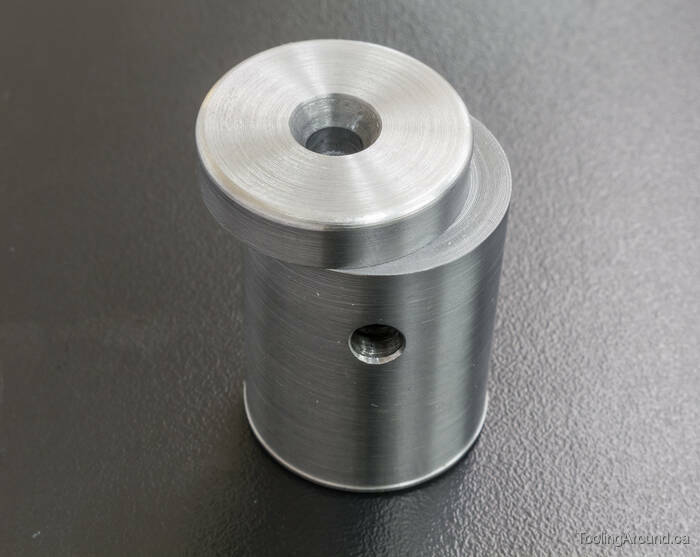 Believe it or not, you will be able to detect a misalignment of just one or two thousandths of an inch. Any misalignment will be easy to detect because we made sure the edges of the arbour and puck are nice and sharp. Thanks, Brian, for another good idea!